Protesters torched a police station in a western suburb of the Tunisian capital as unrest continues in the North African country. Police clashed with protesters early Sunday in a western suburb of Tunis as they tried to contain a mob of some 200 demonstrators. The protesters torched a police station in the Intilaka district. As events escalated, police used teargas and fired live ammunition into the air in an effort to disperse the crowd. A security helicopter flying overhead added to the general sense of chaos, according to a Reuters reporter on the scene. 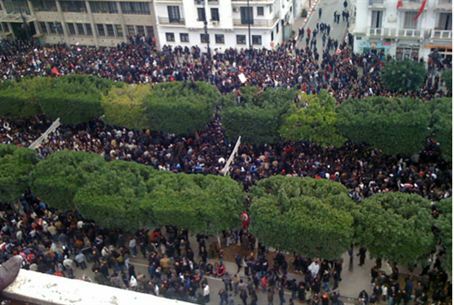 The protest followed a similar riot in Tunis on Friday after Muslim prayers. Hundreds of demonstrators joined a sit-in near the government building in the Kasbah Square, where demonstrations are usually held. Demonstrators demanded the resignation of the Interior and Justice ministers, and prosecution of those responsible for the repression of the “Jasmine Revolution” earlier this year. At least 48 protesters were detained by security forces, according to an Arabic-language Tunisian pro-democracy blogger, kissa-online. Abdelwahab El-Heni, leader of the opposition Islamist Al-Majd party, told AFP, “The police entered the mosque where the protesters were carrying out their sit-in and violently attacked the demonstrators.” El-Heni spent 20 years in exile during the decades-long rule of ousted President Zine el Abidine Ben Ali, who fled to Saudi Arabia in the face of the January uprising. Armored vehicles surrounded the ministries as mobs of young demonstrators wearing opposition T-shirts and bandanas attempted to break through the barrier.